This is a versatile recipe in that you can swap out the Opo Squash for another vegetable (say, zucchini or summer squash). It's okay to use whatever fresh vegetable you want, as long as it has a consistency that's similar to zucchini (the closest taste-texture twin to opo I can think of), or else just adjust the cooking time accordingly. I could imagine improvising on this with some sliced tomato in the mix. You can also use your favorite leafy greens in place of those called for in the recipe. "Ch Ch Ch Ch Changes..."
What changes did I make? Let's start with the greens. 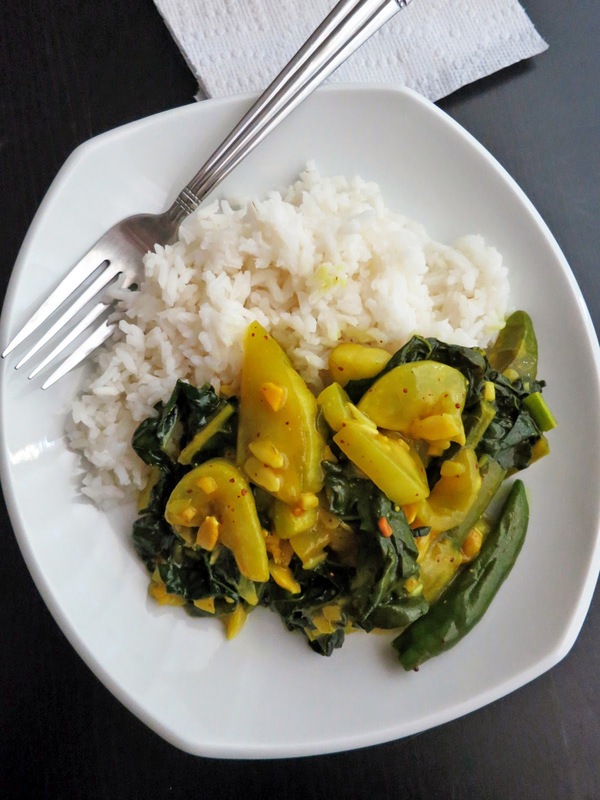 The recipe calls for "twigs of the bottle gourd plant." Call me an outlier, but I can't remember the last time I found myself in a field amongst thriving Opo Squash twiglets. I scratched that one off the list and replaced it with whatever leafy greens I had. I could have easily used kale, spinach, or any other leafy green. 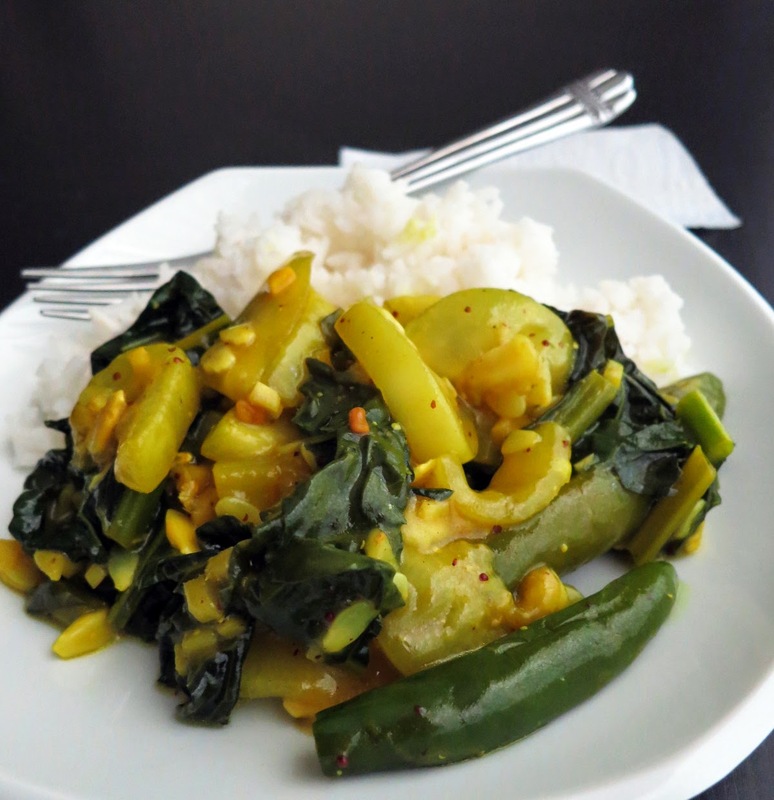 In the moment of the recipe, I used a healthy bundle of ong choy (Chinese water spinach) that I had on hand. And that's not all, folks! The recipe also called for ghee (clarified butter). In the name of cardiovascular systems everywhere, I changed this to olive oil. Thanks to that little tweak, now it's a vegan recipe. News flash: The last time I juiced a ginger root is never. So I nixed the "juice of fresh ginger" the recipe requested and replaced it with the more practical "minced fresh ginger." You can even use grated ginger if you have it on hand. I also dropped the 1/2 tsp of granulated sugar called for in the recipe. Squashes in general tend to have enough of their own subtle sweetness to lend to a dish, in my opinion. Opo squash seeds, in particular, are slightly sweet and crispy (if the squash is not too ripe). So goodbye to those delicious granules, may they fulfill their culinary dreams in some future dessert. Besides, my kitchen is a site of high-velocity cooking. This blog may make it look like an idyllic place of leisure and photogenic food. But it's a madhouse. I can pack the fridge with freshly cooked food from scratch in under two hours. All that the casual observer can perceive is a blur of apron and the motor-like whir of my spinning arms as food happens. What does it mean? It means: "Don't waste my time, you half-teaspoons of baby sugar grains that aren't even going to be tasted when they make it to the finished dish!" I opt for high-impact ingredients that get noticed. Typically that means loud spices and large quantities. Next item. The "Bay Leaf" called for in the original recipe refers not to the bay leaf we love and know in North America as Bay Laurel (Laurus nobilis), but to a different plant used frequently in Indian cuisine and also called "Bay Leaf": Indian bay leaf or malabathrum (Cinnamomum tamala), which has an aroma similar to cinnamon. I typically have some leaves of both varieties on hand, but in this case I was all out of Indian bay leaf so I substituted a pinch of ground cinnamon. Ta-da! Knowledge is flavor. Eager to acquire obscure ingredients but loathe to acquire obscure kitchenery, I found myself not in the possession of a karahi/kadai nor of a wok. "Gasp!" you say, "How can she survive without a karahi?" I often ask myself the same question. Answer: I make do with my fancy sautee pan, and that's what I call for in the recipe below. That concludes the major changes to the original recipe I used as Opo-inspiration. It may sound like the resulting dish is quite a bit different, but I assure you that the overall idea and taste of the dish remain unedited: only convenience has been altered -- no flavors were harmed in the process. 4-5 whole green chilies. Serranos work well. (If you want a spicy dish, chop one up, otherwise leave all whole. If you're totally capsaicin-intolerant, use a sliced green bell pepper). A small amount of thickener of your choice to thicken the sauce: flour, corn starch, arrowroot powder, Kudzu root starch, etc. I used a few teaspoons of arrowroot powder, which thickens quickly in hot liquids, stirred into the pan at the end. Freshly-made rice (or grain of your choice), to serve with the dish. 1. Wash and chop the leafy greens. Chop the opo squash/bottle gourd. 2. Heat a sautee pan and 1 T olive oil. Add the chopped opo squash and whole chilies. 3. Cook for a few minutes, then add chopped leafy greens. 4. Cook a minute or two longer, being sure to fold the squash over the greens so they cook. 5. Add the turmeric powder and salt, stir it in until thoroughly mixed, and then cover the pan. The salt will cause the veggies to release water into the pan, which becomes the base of the sauce for this dish. 6. Cook for 15 min, or until the squash and greens are cooked but not mushy. 7. In a frying pan or a pot large enough to hold the squash mixture, heat 2 T olive oil. Add the whole fenugreek seeds and ground mustard seeds and fry for 15 to 30 seconds (and only 10 seconds if you're using ground fenugreek) - the spices should give off a nice aroma as the fry. Add the minced ginger, and then pour the squash mixture into the oil and spice mixture. Mix well. 8. Thicken the sauce with the thickener of your choice. I always use arrowroot powder because it never clumps up or causes issues for me. If you're using arrowroot powder, add up to 1 T, mixed first in a small amount of cold water and then poured into the pan with everything else. Heat and stir constantly until the sauce is thickened. Taste and adjust salt as needed. Don’t add any water (aside from the small amount needed to dilute your thickener); allow the vegetables to cook in their own moisture. Here's to variety! Please let me know if you have any questions or comments via the comments section below!